There is good news for those contestants who are eagerly seeking for the government jobs in Staff Selection Commission. Here, we are going to share all the relevant information related to the SSC DEO LDC Application Form 2019 in the below section of the article. This is the great opportunity for all those contenders who want to make their future bright in Staff Selection Commission Department then they must read out this full article and get all the details from here. Contestants may apply online for SSC CHSL Recruitment 2018 from the official portal of Staff Selection Commission that is www.ssc.nic.in. For more notification regarding the upcoming government, admit card, answer, and result etc. So, you can bookmark our careerjobs360 page and get all the latest updates from here. The Staff Selection Commission Department has released the Official notification for SSC CHSL Notification 2019 for hiring eligible and passionate candidates in the vacant positions of Lower Division Clerk, Data Entry Operator, Postal Sorting Assistant and Court Clerks in the department. SSC Department has released SSC CHSL Recruitment 2019 on 19 January 2019. The Staff Selection Commission Department will conduct Combined Higher Secondary Level entrance exam to recruit talented and eligible candidates on the vacant posts in the department. Interested aspirants may apply online for SSC CHSL DEO Recruitment 2019 on or before the deadline date which is 18 February 2019. Now eligible and interested aspirants may apply for SSC CHSL 10+2 2018 Application Form from the official portal of SSC i.e. www.ssconline.nic.in. Academic Qualification: Interested applicants must have completed 12th or its equivalent education from any reputed Board/Institution. For more information aspirants must visit the official notification of the recruitment. Maximum age limit of the participants is 27 years. Age relaxation will be applicable to the reserved category as per government rules and regulations. General/OBC category of aspirants must have to pay Rs. 100/- as application form fee. SC/ST/Female categories of candidates are exempted from the application form fee. Pay application form fee by using Debit/Credit Card & Net banking or any other mode of payment. They can pay application form fee in offline mode also by submitting E-challan in SBI. Selection Procedure: The selection of the candidates will be done on the basis of their performance in the written test which is going to be organized by the Staff Selection Commission. 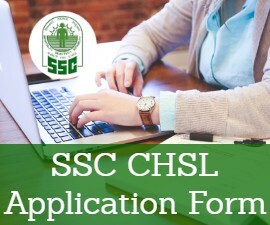 Way to fill the Online SSC CHSL DEO Application Form 2019? Firstly, competitors must have to browse the official website of Staff Selection Commission which is www.ssc.nic.in/ssconline.nic.in. On the homepage go to the advertisement section and search out the SSC CHSL 10+2 Recruitment 2019 Notification Link. Then download the official notification & open the notification on the next webpage. After that, Read the complete official notification carefully before applying for the given post. Now hit the apply online link. Now, register yourself with your valid email ID & valid contact no. After filling the online application form without making any mistake in it. Attach all the scan copies of the required documents with the form. Upload recent passport size Photograph & signature with the application. Remit the application form fees. Then finally click on submit tab button and submit the application. At last, Take the hard copy of the application and keep it safe for further use.